Please find below a compilation of frequently asked questions about our Journey Planner. If you encounter a fault with the Journey Planner that is not identified below please use our Journey Planner feedback form to let us know straight away. The Live Arrivals was showing me results in a minutes countdown format and 24 hour format. What does this mean? When there is a minute countdown it means that the real time information system is correctly tracking the bus location via its activated GPS device. When the system cannot find the GPS location of a bus scheduled to arrive it will automatically show the scheduled time as per timetable. A timetable PDF/web version is not loading, how do I report this? The links to bus services PDF/web version timetables open a new tab on the Traveline Southwest website. This can sometimes take a few seconds, but if the timetable never loads or you receive an error message please let us know straight away so we can investigate and contact Traveline Southwest if necessary. Please use our Journey Planner Feedback form to inform us of this fault giving as many details as possible. Where can I find a timetable and/or route that is going to change/start in the future? The Planner gave me odd results that don't make much sense, is there a way to report this? We can't test every single possible journey, so please let us know your start and end locations and what were the odd results given so we can test and fix as soon as possible. Please use our Journey Planner Feedback form, selecting Journey Planner. I'm having some other issues seeing or using the Journey Planner, what can I do? If you can't find the answer to your question on this page, first please make sure you're using an up to date browser, as older browsers may cause issues when using our website and online tools. If you're still experiencing issues, please send us as many details as you can through our Journey Planner feedback form. Can I add your Journey Planner to my website? You can't add the whole Journey Planner, but you can add a widget that has the Start and End fields and our logo. You can also pre-populate the fields before adding to your website. Have a look at our Journey Planner Widget page for more information. Is the information I write in the Journey Planner private? Where does the Journey Planner data come from? We actually work with a lot of different data providers to be able to deliver a seamless experience in one window. Although this is a complex work for developers due to all the different data formats, it provides a failsafe in case there is a technical issue with just one dataset as it won't make the whole journey planner unavailable to you. Car Clubs: We connect to ComoUK's API (Previously known as CarPlus) to retrieve locations for car club bays. Charge Points: We connect to the Data.gov.uk's National Charge Point Registry to retrieve charge point locations. Bristol: our own data, updated by our team. 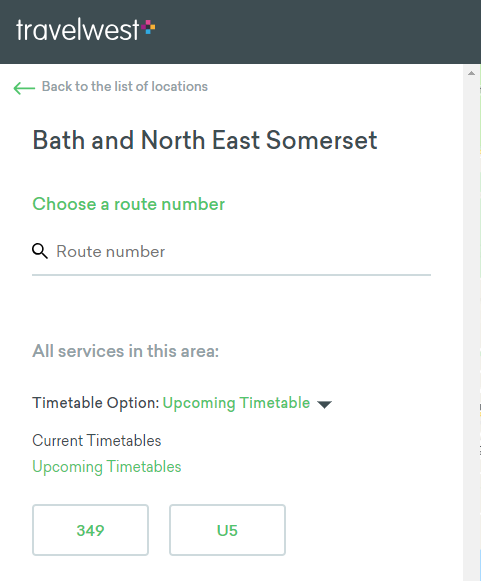 Bath: trakm8 has connected to an open data dataset available at https://data.bathhacked.org/resource/6e9r-8trr.json. Bath & North East Somerset: https://data.bathhacked.org/Transport/BANES-Live-Car-Park-Occupancy/u3w2-9yme. South Gloucestershire: Data was not available at the time of the project. Cycle Hire: We connect to an API created by trakm8 that combines both YoBike and NextBike real time data of available bikes. This was created as part of the REPLICATE project. Train Stations: We connect to Bristol Transport API, who retrieve the original data from National Rail's Darwin API. Rider Zones: We connect to an API available at https://opendata.bristol.gov.uk/explore/dataset/rider-zones/, updated by our own team. Bus and rail live arrivals and departures: The Bristol Transport API combines and sorts data from both the West of England bus real time information system supplier (the same info you can see on real time information displays at bus stops) and the National Rail's Darwin API for rail information. This is then made available through a more developer friendly API that we can connect to. Bus stops, bus routes and timetables: This data is sent separately by bus operators to each of the Local Authorities in the West of England. It's then manually sorted and quality checked by Local Public Transport Teams and uploaded into a system used by Traveline Southwest (aka SWPTI) for sorting. The sorted data is then sent back to us in a different format and combined into one single developer friendly data source by a process designed internally so that we can use it in our Journey Planning tools. This guarantees that our data is always the most recent. Public Transport (Bus + Rail) + Walk Journey Planning: We connect directly to the SWPTI API provided by Traveline Southwest for these results. Traveline uses their own smart algorithm to calculate the best journey options using public transport data from bus and rail operators. Drive Journey Planning: We connect to the Google Directions API for these results. Cycle Journey Planning: We connect to the Cycle Streets API for these results. Walk Journey Planning: We connect to the Google Directions API for these results. Bike Hire Journey Planning: trakm8 has combined available real time bike hire data from YoBike and NextBike with Cycle Streets cycling directions to create these results. This was created as part of the REPLICATE project. Bike and Public Transport Journey Planning: trakm8 has combined available real time bikes data from YoBike and NextBike (where applicable) and Cycle Streets cycling directions with Public Transport directions by Traveline Southwest's SWPTI API to create these results. This was created as part of the REPLICATE project. Drive and Bus (Park & Ride): trakm8 has combined driving directions by the Google Directions API, with Public Transport directions by the Traveline Southwest's SWPTI API and data for Park & Ride locations to create these results. This was created as part of the REPLICATE project.